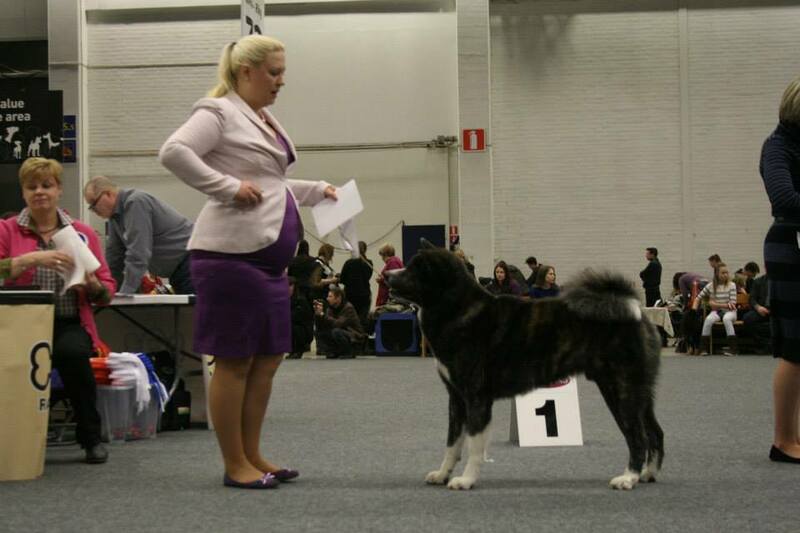 I started the year 2013 in my mind to collect great results from shows to as many dogs bred by me as possible. And we really did that! 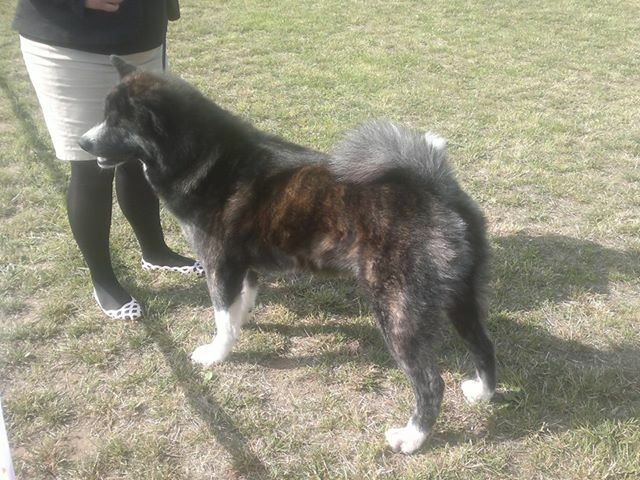 We got several CACs to amazing seven different dogs. 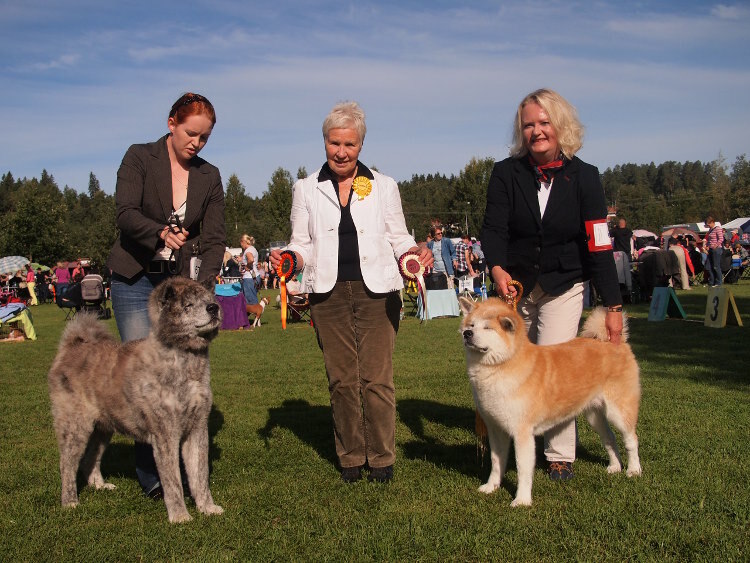 There were also siblings Inuki and Hulda who finalized their Finnish Champion titles. 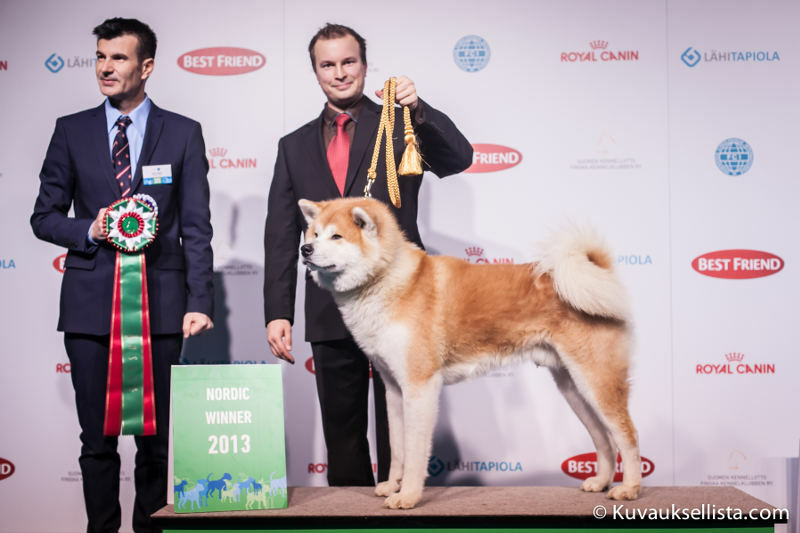 Inuki also got championships from Norway, Estonia and Lithuania. And he ended his year to Winner title. Can he even do any better? 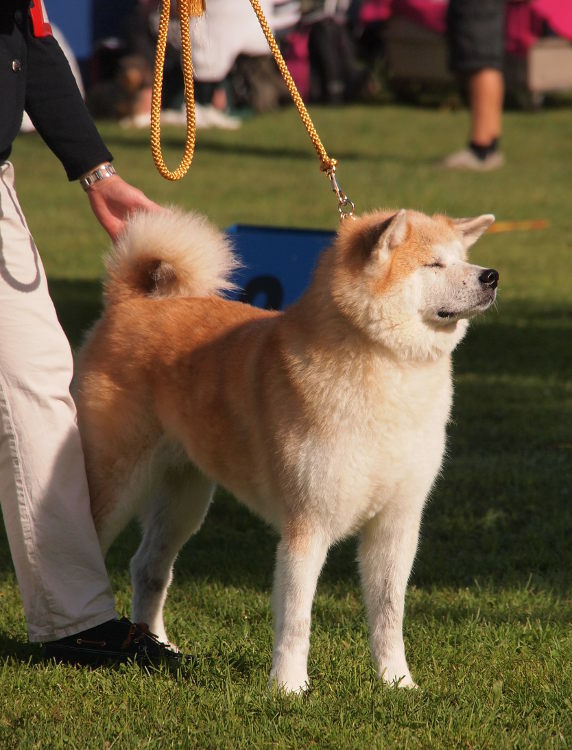 Our grand old lady Aiko was also many times BOB-veteran. 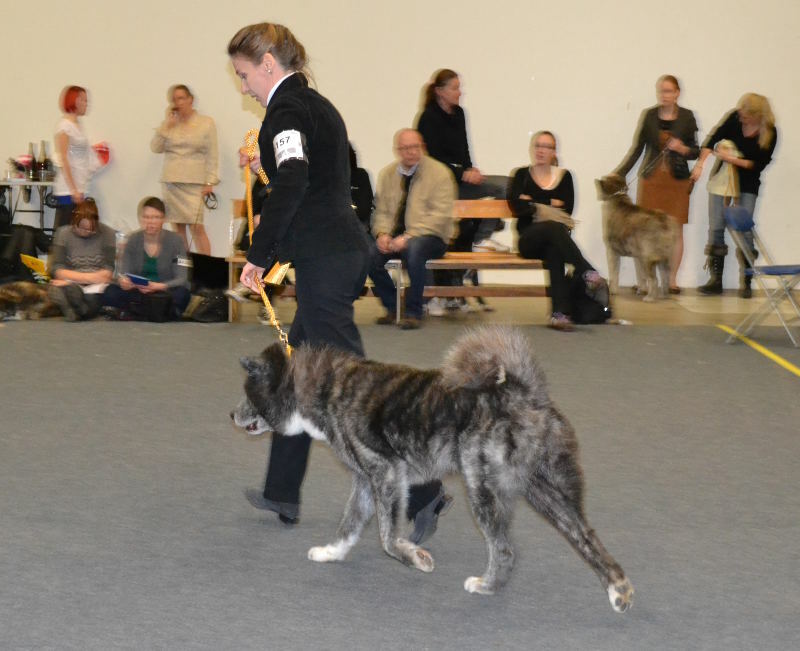 Our dear Sulo turned 8 years old at October so he returned to show rings at the end of the year and was awarded BOB-veteran at Helsinki Winner show where he also got a new Veteran Winner title. 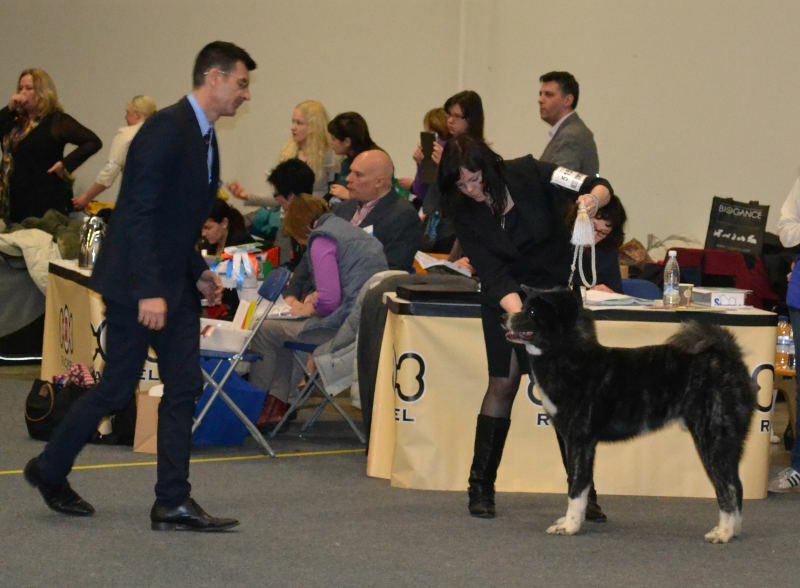 Marski continues his amazing rhythm was finalized his year winning BOB at Nordic Winner show, 31 Akitas entered, under the breed judge mr. Nikos Vazakas. 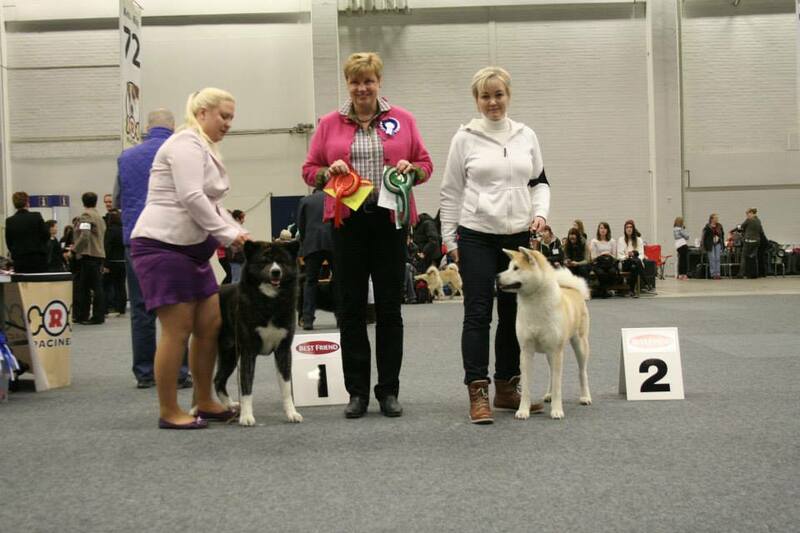 Also our dear Valo started his puppy classes and was BOS-puppy at the Nordic Winner show. We are very pleased to his starting show career. This year also got us the first placements at Group finals! 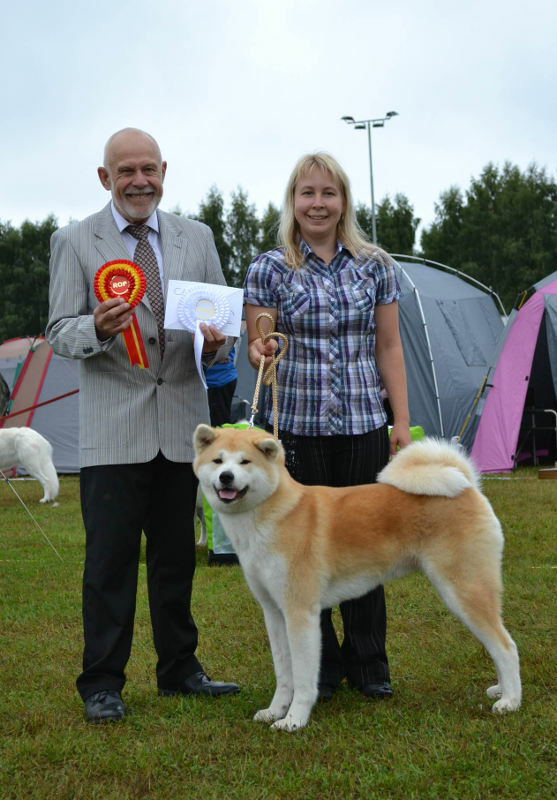 Reetu was Best of Group 2 at Mikkeli national show and Inuki was Best of Group 5 at Lithuanian national show. Amazing boys!! So I can definitely say it has been an amazing show year..
...With all the placements and Res-CCs and Res-CACIBs. A good year indeed. At the Winner show only three VU entered the show. 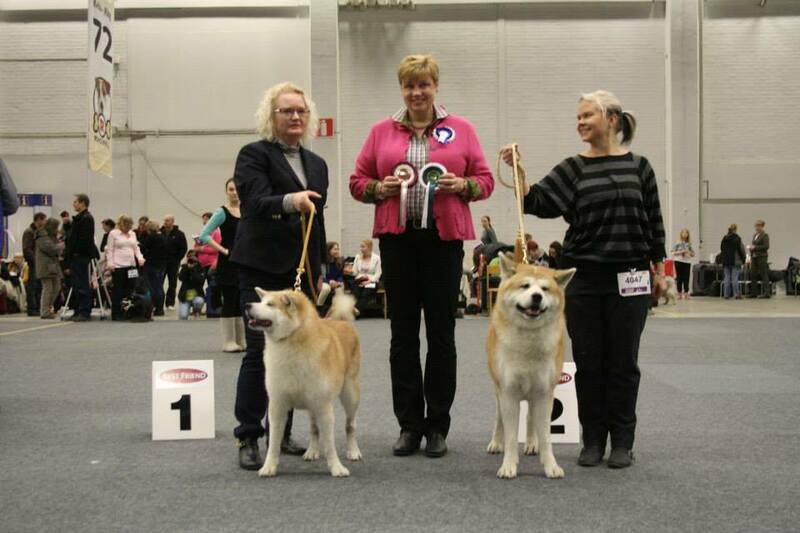 But with great results... Inuki was BOB, Aiko was BOB-veteran and Hulda 3rd best female! Congratulations Kevin, Davina, Tuulia, Niina, Virve and Niko!! I'm very proud of you. Hulda got only half of her coat on, so the placement was really great. 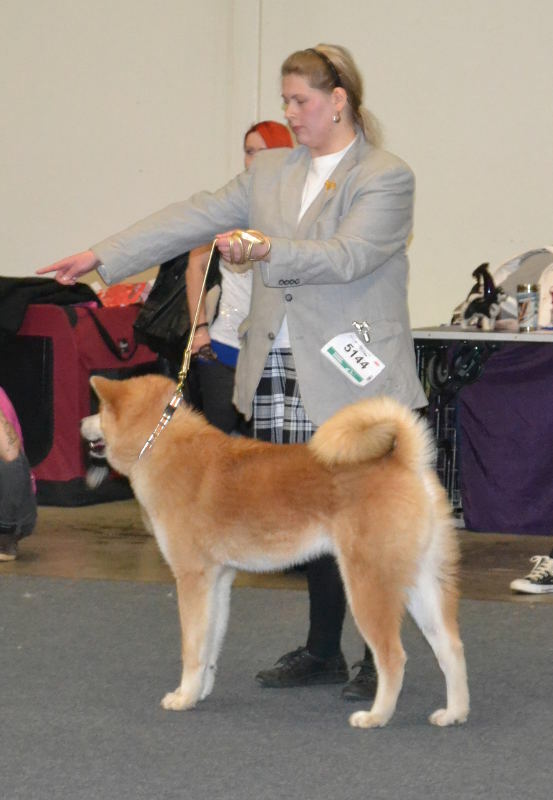 Also Inuki was missing some coat, but still managed to charm the judge. 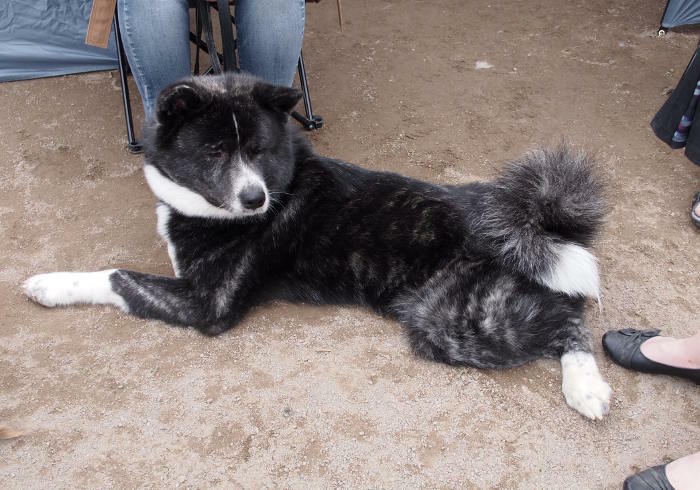 And Aiko was her lovely self. 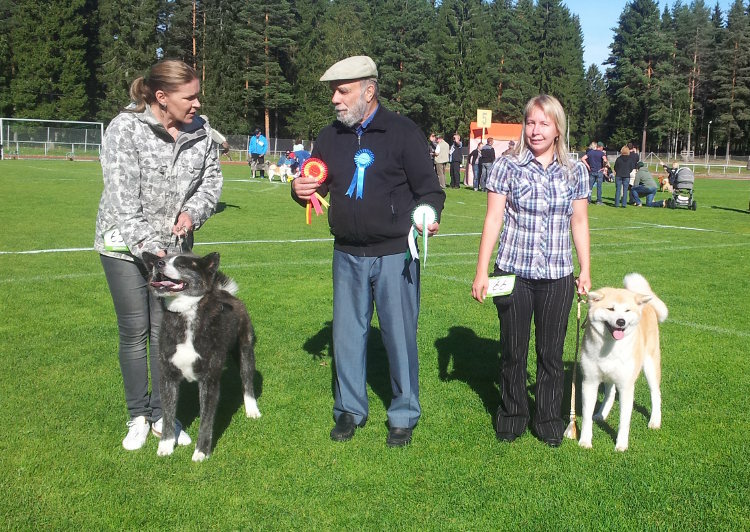 Niina got a really nice day, because her dogs Aiko and Agari was BOB-veteran and BOS-veteran. I got to go to the ring with Agari. It was nice to help. Thanks to the judge. Viribus Unitis breeder's group 1. We got mr. Nikos Vazakas from Greece to judge Akitas. 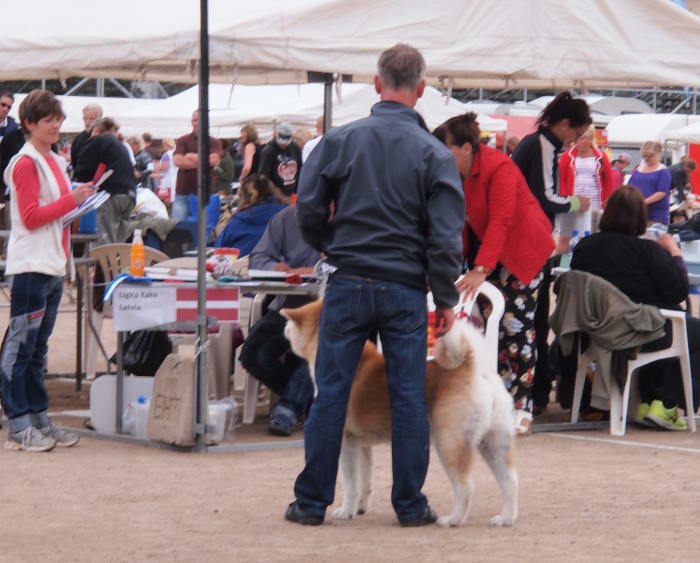 He is an Akita breeder himself so it was exciting to see what he wants. 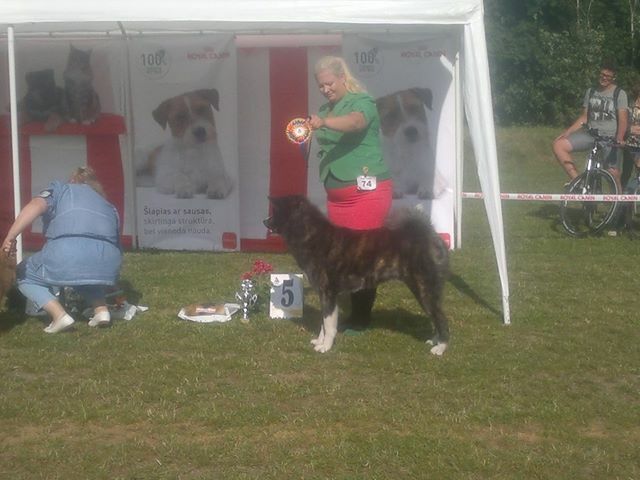 And he loved Marski who was BOB from 31 entered Akitas (+puppies). The judge were harsh, he didn't pass any prices if he didn't the dog deserved it. 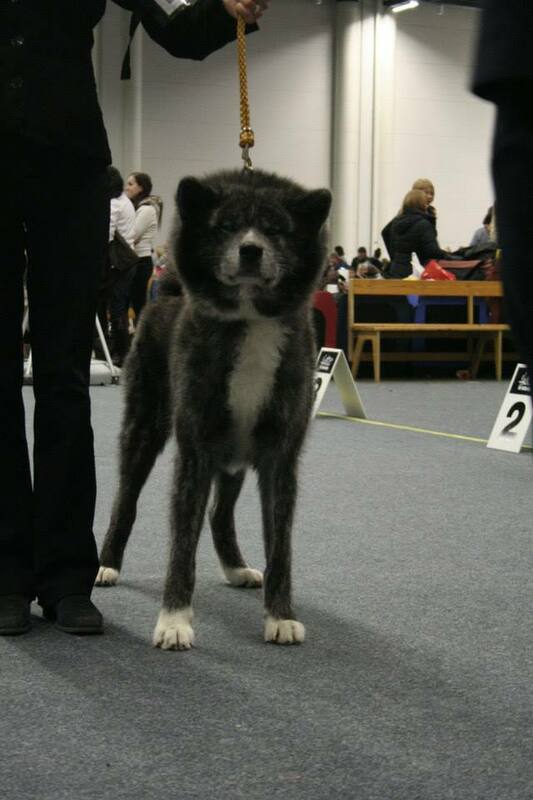 Only seven Akitas was awarded with SQ and two of these were Marski and Reetu! Later on Marski won it all, gaining BOB and CACIB. Niko was in the ring with Marski for the first time. Huge congratulations Timo, Niko and Virve!! Valo was at puppy class and won male puppies with a great judgement from the judge! Our dear teddybear. 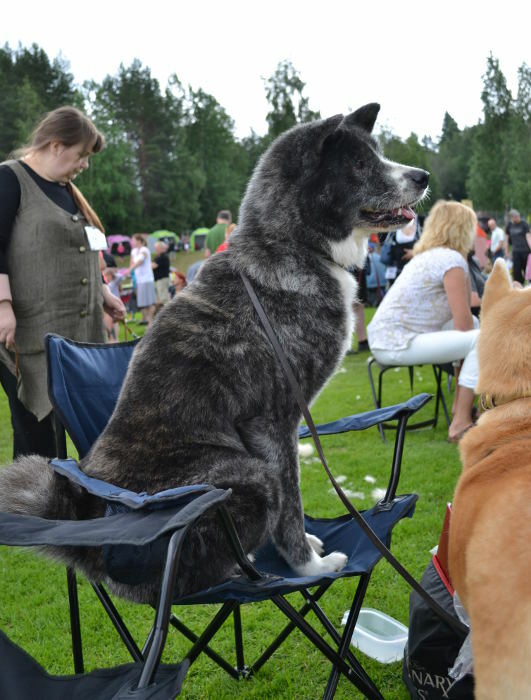 At the end Valo was BOS-puppy. Congratulations Salla!! All the veterans got only very good from the judge. 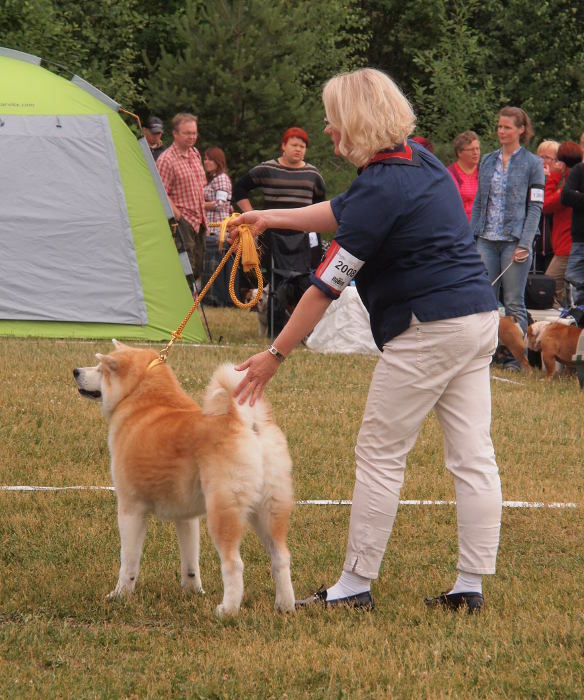 Sulo was placed first. 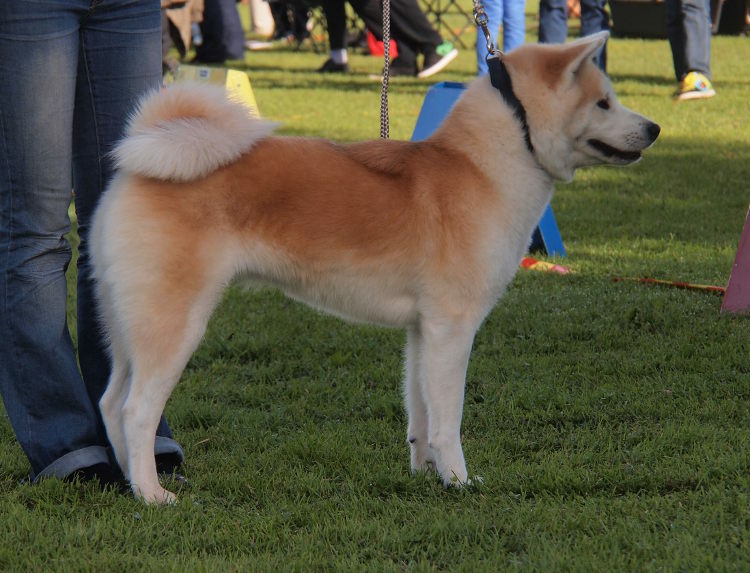 Also Aiko got very good, being the only female veteran Akita. Lovely boys Akira, Inuki and Nasu was also entered. The boys were wonderful and they all got very good. 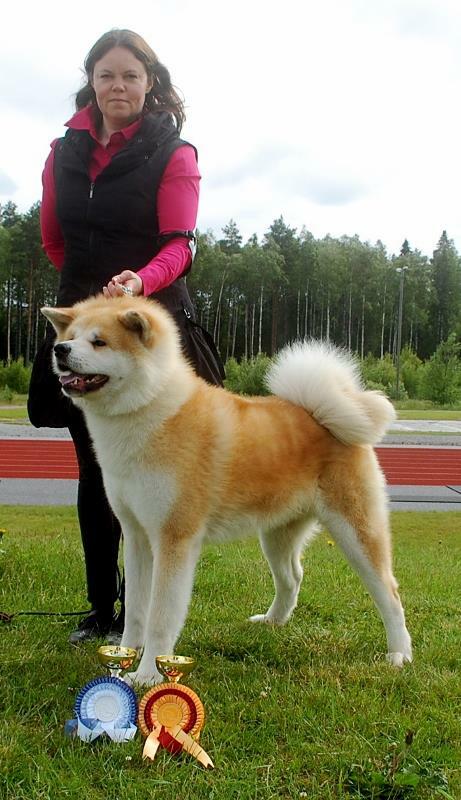 Special thanks to Katri, kennel Midian's, for handling Akira. I'm so proud of my boys. 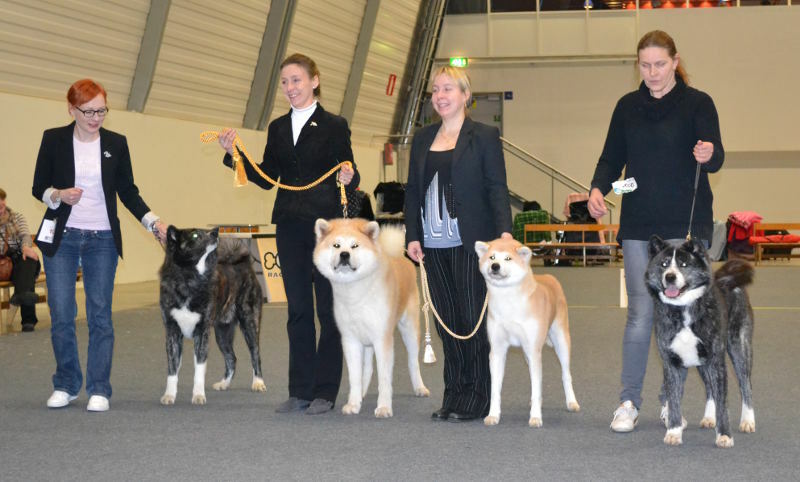 Only three VU-females entered the show. Among Aiko, there were also Hulda and Sissi. Hulda got excellent, but not SQ because of her coat what was still missing half of it. Dear Sissi was missing almost the whole coat, she got good. Thank you Virve and Niko for showing your lovely girls. My breeders group was first, two groups entered. 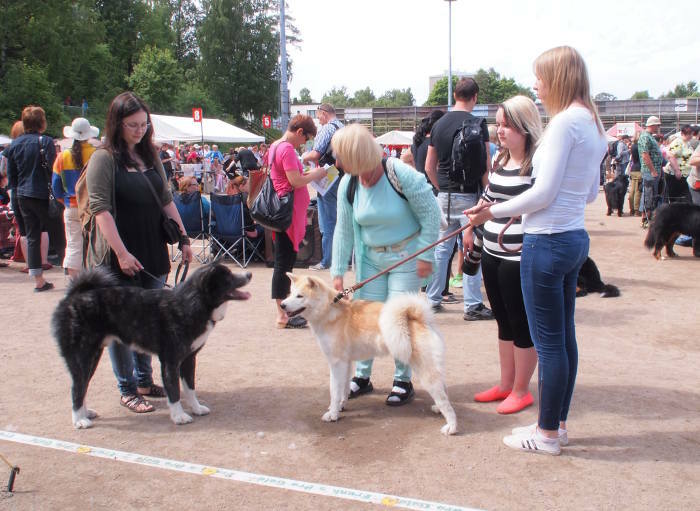 There were Inuki, Hulda, Nasu and Reetu at the group and the judge liked very much the dogs, but didn't give us honour prize because the dogs didn't match. I know, the dogs were great, but not combined together the group. But I'm glad because what the judge thinks of my dogs. The day was long, but wonderful. Thank you all my friends who came there. It is always wonderful to see you and your dogs! And thanks to the judge. Our dear Sulo has been on vacation from the shows from a long time. 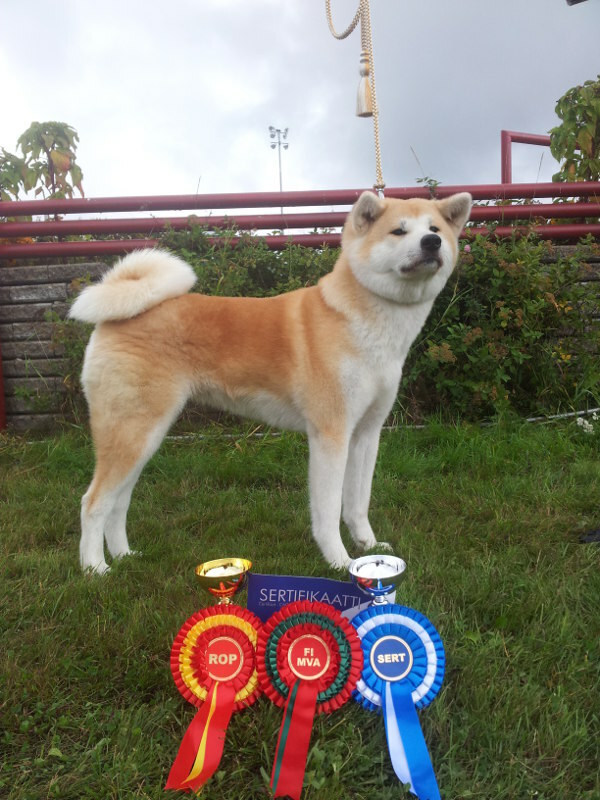 Sulo had his 8th birthday at October, so he entered his first veteran class with a great results! He was BOB-veteran and got a new title; HeVW-13, and he was also 3rd best male. Wonderful start for his veteran rings. Congratulations Minna, Harri and Hertta!! 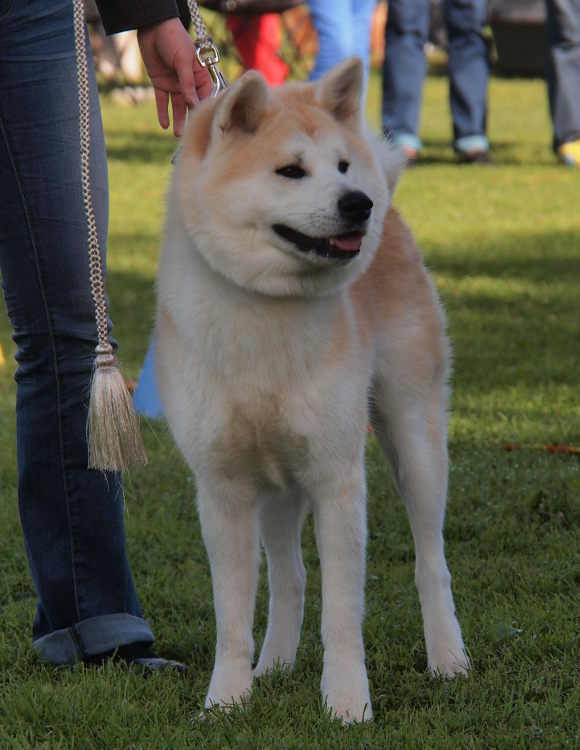 Also Sulo's grand child Kuro entered the show. Kuro got very good. 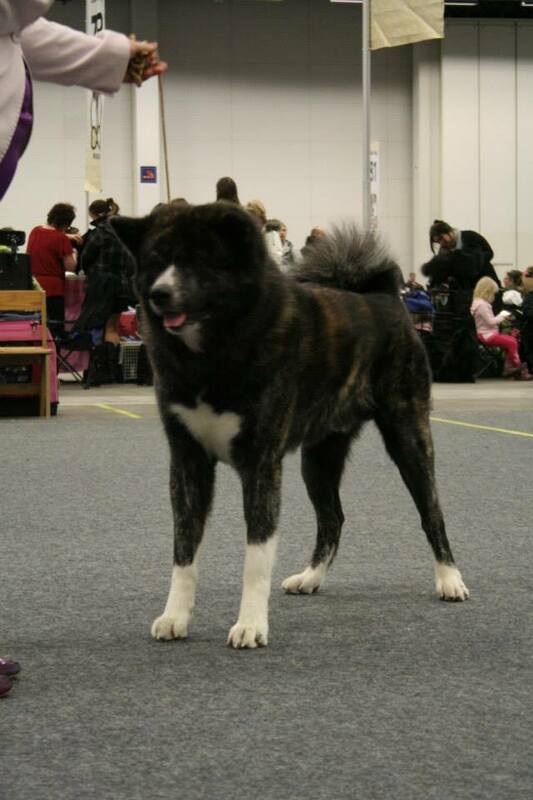 Thank you Mirva and Teppo for entering Kuro. 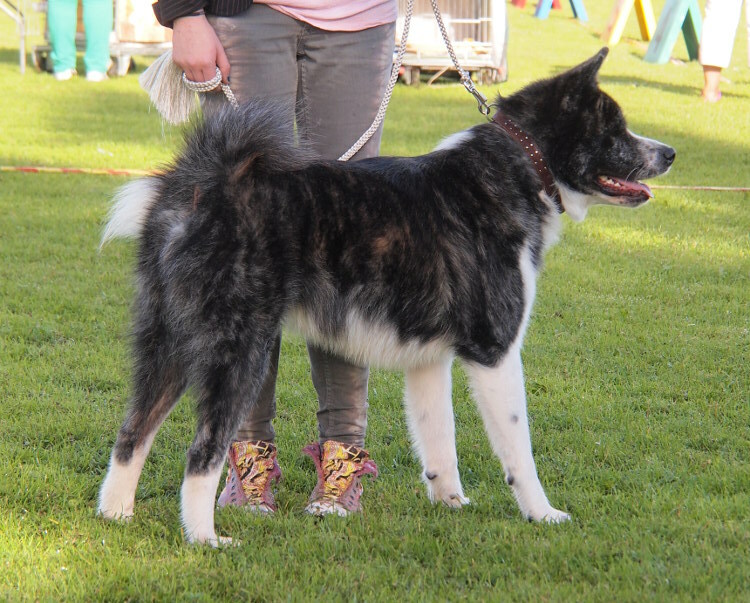 Sulo and Kuro are so lovely, beautiful brindle Akitas. Thanks to the judge. 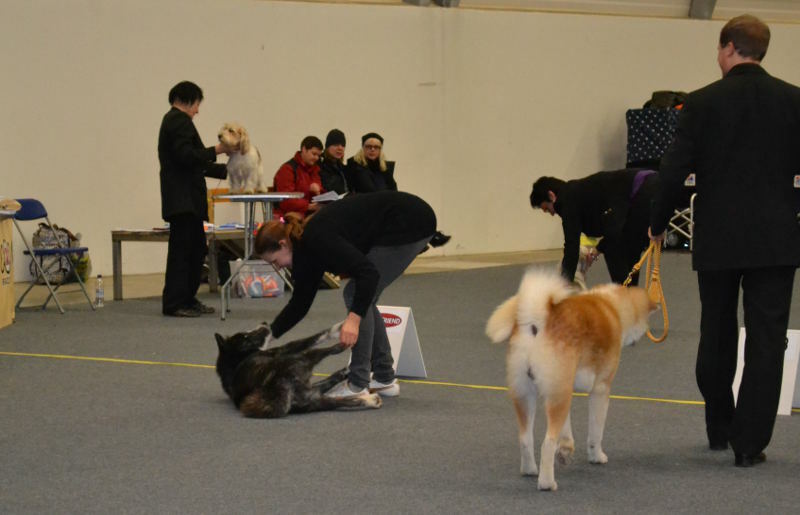 The floor was very slippery, but Salla handled Valo well! Great result, congratulations Salla! Thanks to the judge. 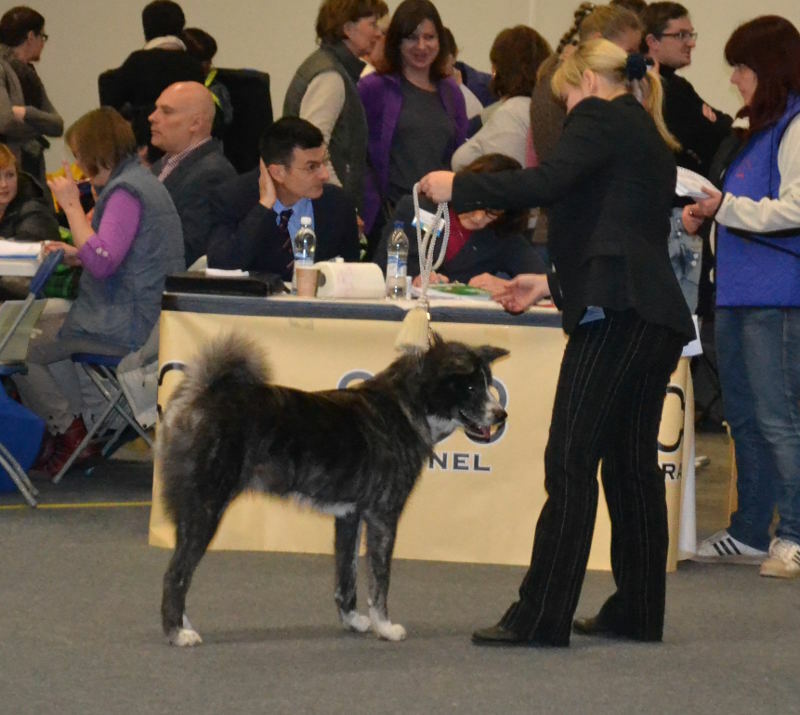 There were 35 entered Akitas! The speciality was held outside in a rain.. 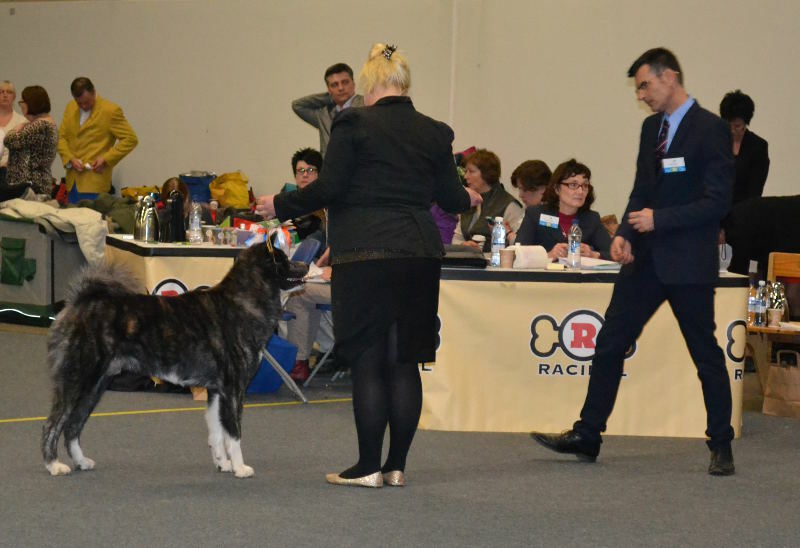 The judge liked very much Jyry and his brindle color. The judge were really strict with males and gave only to five males SQ. Well, three of these males were ours (Jyry, Ruuti and Marski)! So not bad! 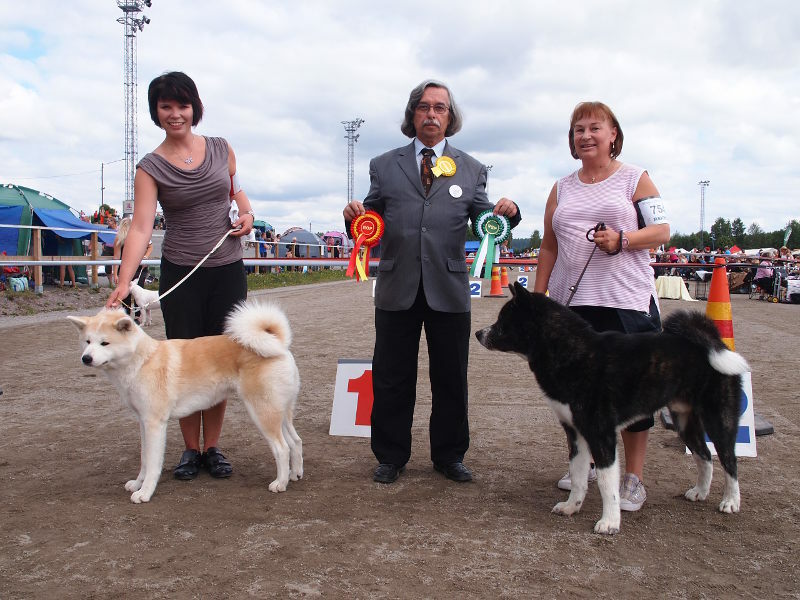 After the ring there were extra competition for best brindle, red and white akitas. 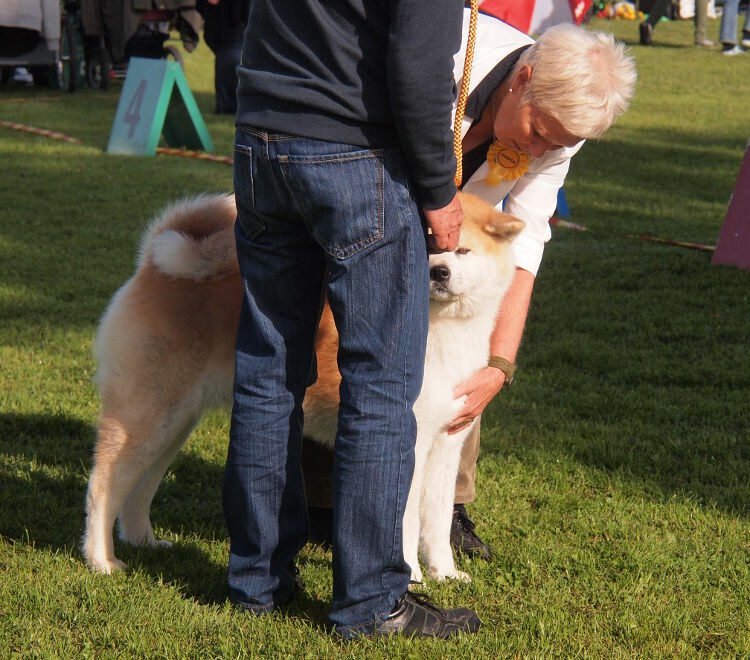 Jyry was rewarded being best brindle Akita. Jyry got his first CAC. Huge congratulations Saku! And thanks to Virve who handled Jyry well! Reetu was fourth at males, and when Kirsi started to run with him I got admired thanks from other people outside the ring. Reetu really moves wonderfully. Congratulations Kirsi and Sirpa! Marski was great, as always. He was second best male, just like last year. Congratulations Timo, Virve and Niko! 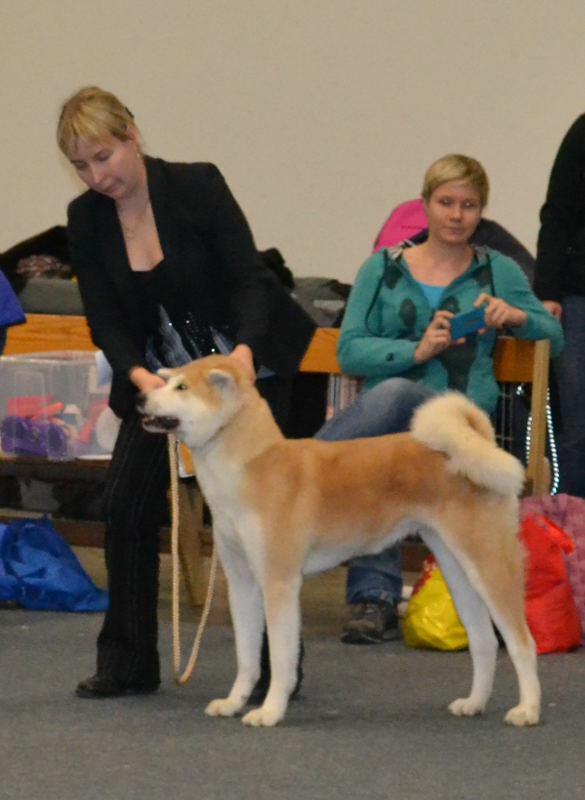 Topi was totally out of coat, but he still got excellent and was second best male from open class. Congratulations Noora! V�in� was in his first show and performed well with Niina. Thank you Afra and Anna for bringing V�in� to the show! 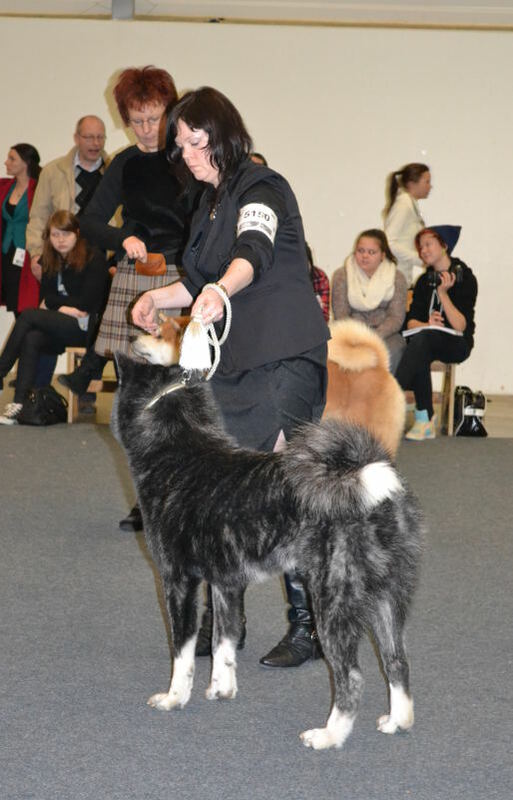 Also Valo was in his first show and he went well with Salla. Valo has become a hansom male. 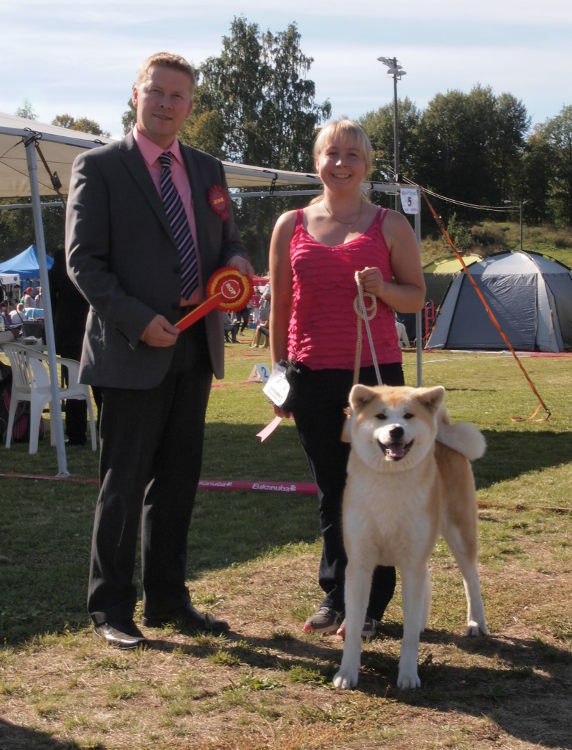 Valo was second best male puppy with honour prize. Congratulations Salla and Soili! There were only four VU females at the show. Aiko is amazing, one show after another she is rewarded as best veteran. Also this time she was BOB-veteran. Congratulations Niina! 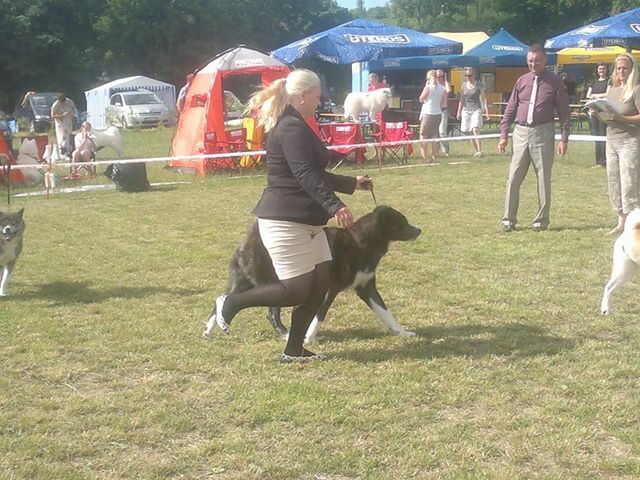 Also Hulda performed really well and was placed third. It was really well, because there were big bunch of females with SQ. Congratulations Virve and Niko! Also Sissi was entered and she was lovely herself, she got very good. 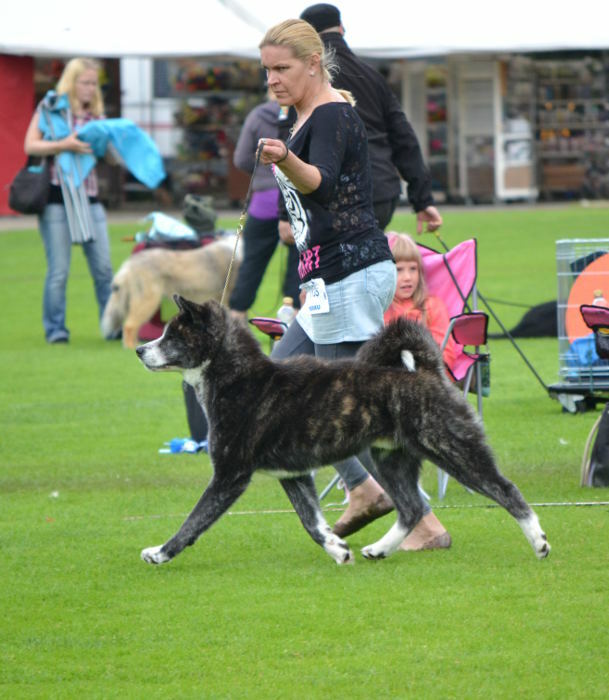 Hilma performed steady, like she always does. She goes so nicely with her owner Timo. Congratulations Timo for Hilma's excellent! 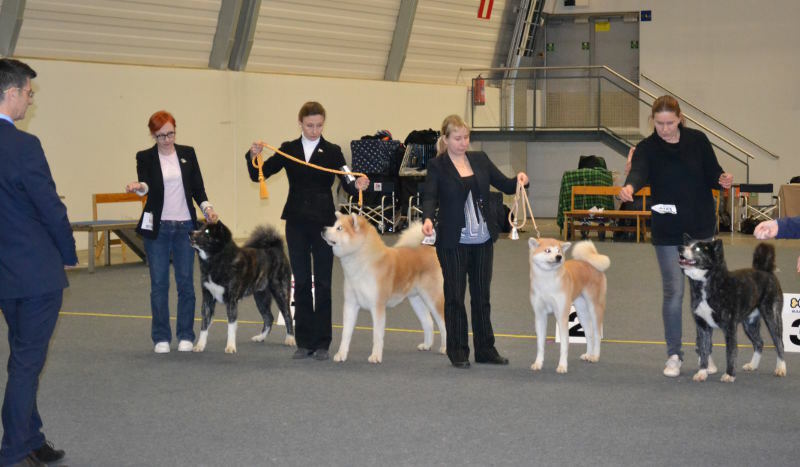 My breeder's group contained Jyry, Reetu, Hulda and Aiko, and was awarded the second place with honour prize. Thanks to all my dear friends at speciality. Special thanks to Virve, Niina and Timo for bringing all the food and thanks Timo and Saku for placing the tent up! It was a really great because of the rain. 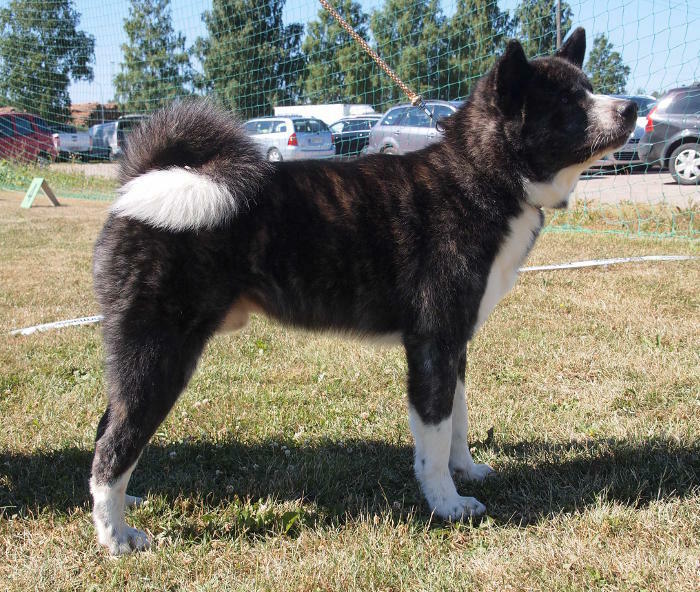 Pictures coming later..
Hulda was the only Akita who got SQ, so she was also BOB. 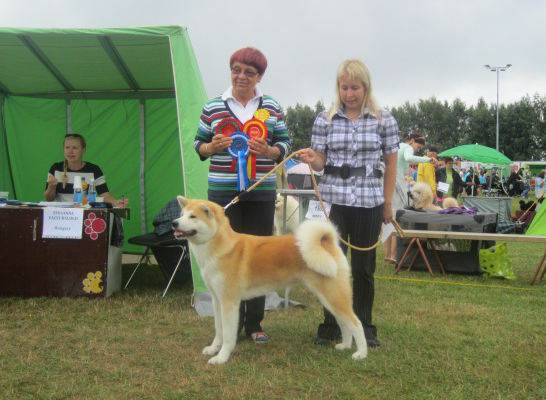 The weather was really hot, luckily the judge�s ten made a big shadow to the ring. 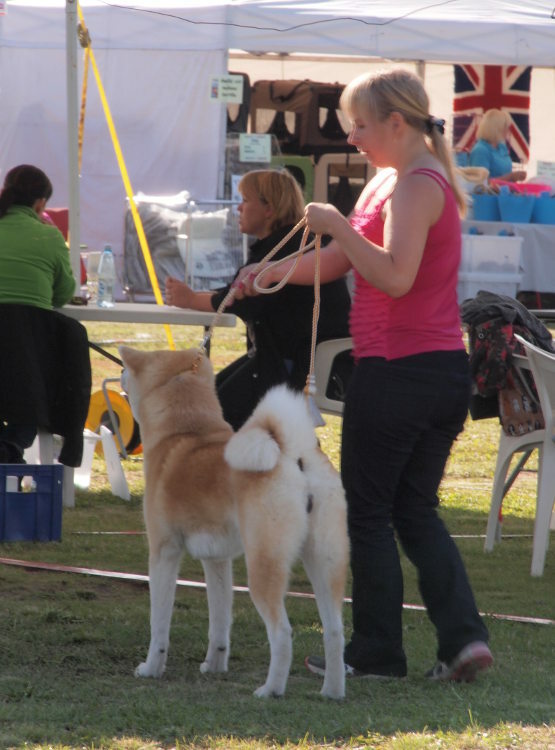 So dogs and handlers could use it while the judge was judging. 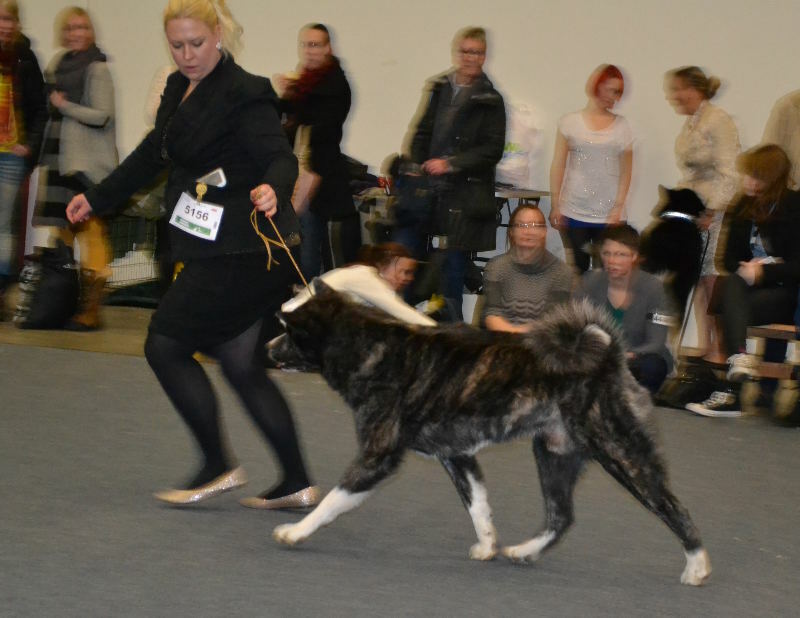 Hulda showed herself really, really nicely at the ring. I was amazed Virve�s and Hulda�s work together. Way to go Virve! Congratulations Virve and Niko for Hulda�s success! Hulda going strong.. BOB again. Congratulations Virve and Niko! Aiko was BOB-veteran and best female + BOS! The judge said that the best movement came from veterans. 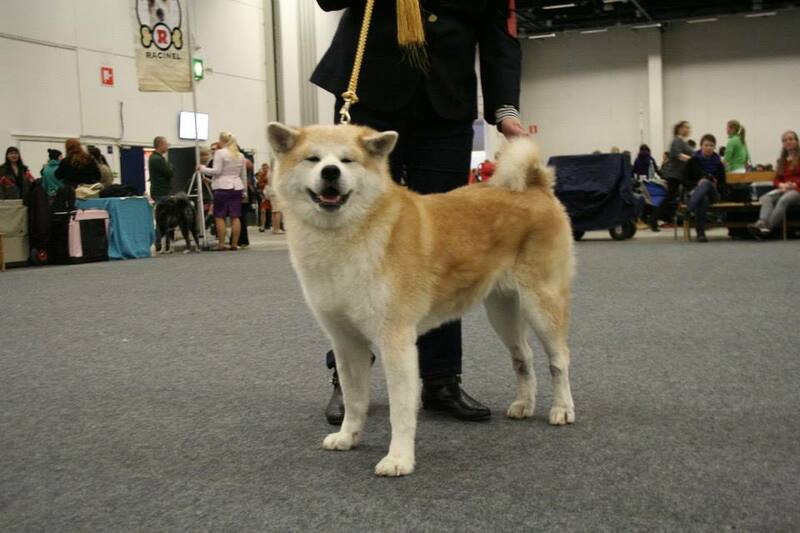 Congratulations Niina for Aiko�s great success! Reika was at her second show, now with full coat. 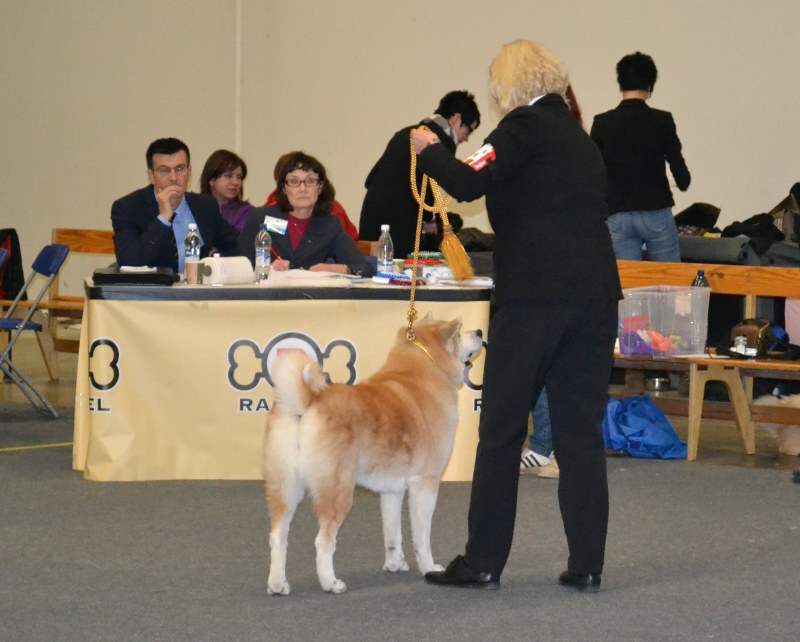 And that shows.. Reika was second best female with her first CAC! Congratulations Reijo, Marja and Elina! And thank you Jenni for handling Reika! Congratulations also Jenni for your own veteran male BOS-placement. The judge gave only two SQs to females; to Aiko and Reika. Marski was BOB, congratulations Timo & Co.! Hilma was loving herself and was so happy that she took few jumps on the ring. The judge liked her but thought she was too heavy. So very good to Hilma. 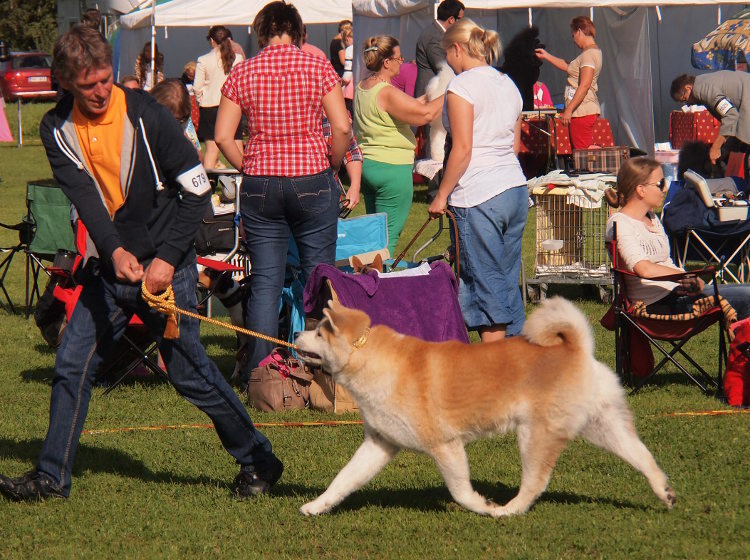 Lafu was at his first show. He is a wonderful male, but unluckily he started to limp, so he didn�t get a result. 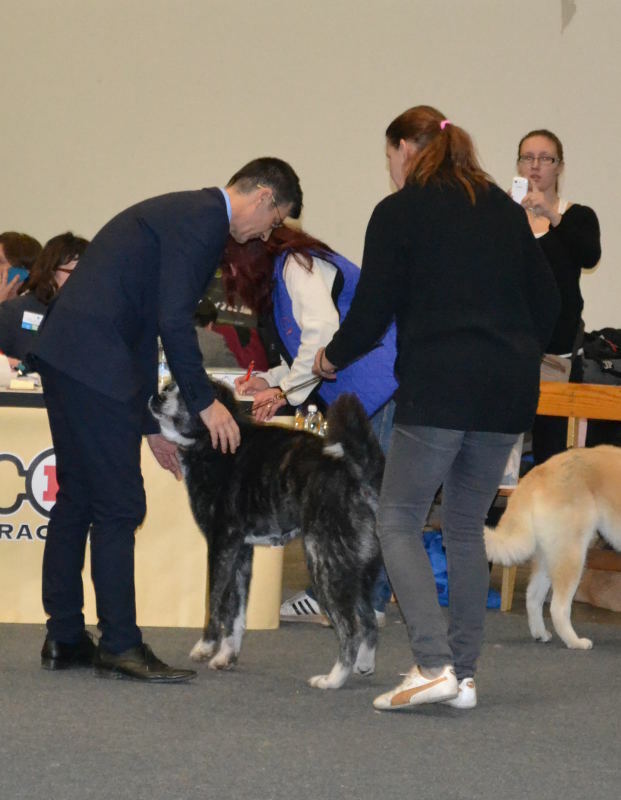 Lafu�s judgement was really great and I think he would have been competing against CAC if his movement would have been ok. Good luck Alisa to Lafu�s next show! Congratulations Kirsi and Sirpa for Reetu�s second CC and BOB! Congratulations also to VIrve and Niko for Hulda�s BOS! Beautiful half-siblings Hulda & Reetu. Amazing weekend for Hulda. Two shows and two BOB. Wonderful! Congratulations Niko & Virve! The judge liked Hulda so much that he asked Niko to send him the picture of him and Hulda. So Hulda really had what the judge was looking for. 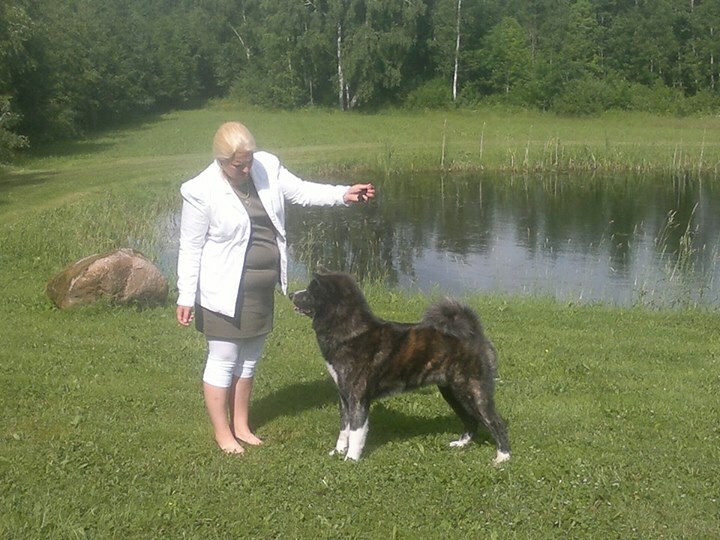 Only four months after Hulda�s mommy-holiday and now she is Finnish Champion!! My warmest congratulations to Niko and Virve!! The judge was really strict and didn�t want to give cacibs. Also Sissi was in a good condition and melted the judge�s heart. Sissi got excellent from her. I�m really happy for the both great results. The judge liked very much Hulda�s type. Specially he liked Hulda�s beautiful coat. Last CAC was so close. Maybe next time! Congratulations Virve & Niko Hulda�s second place! Our judge at Turku show was really personal. I liked his style to handle ring and dogs. He talked to the audience what he likes and what he doesn�t like. 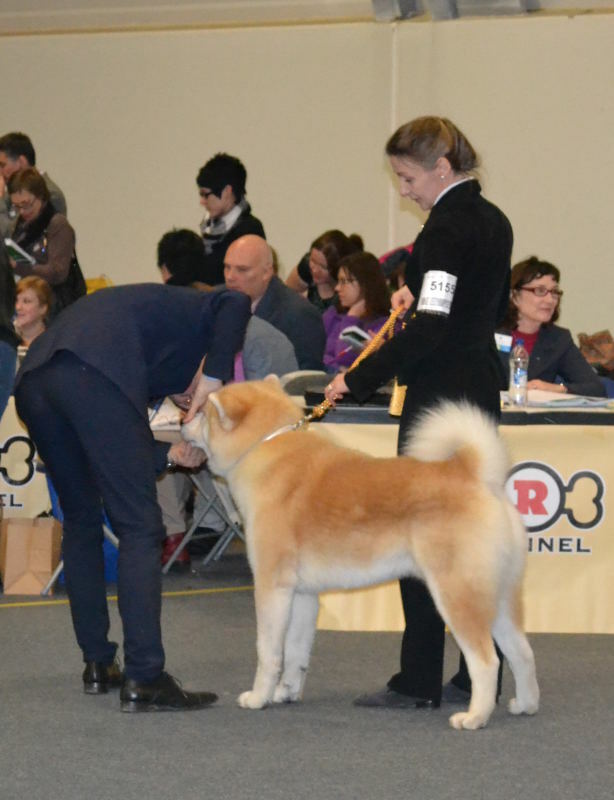 About Daiki the judge just said that he is not a normal junior � he is champion class Akita! 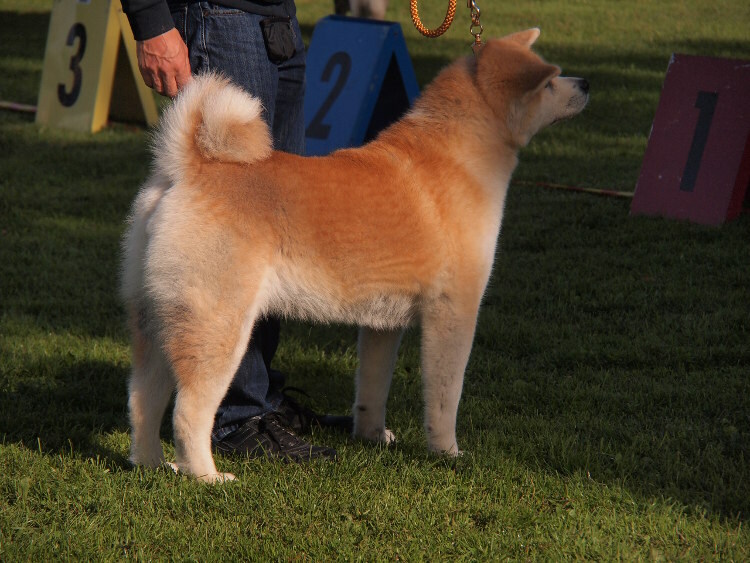 Daiki was BOB at his second show and got his second CAC. Congratulations P�ivi! 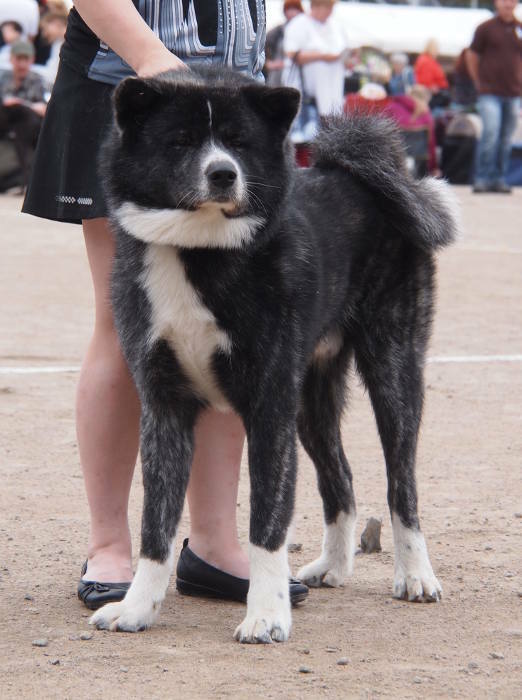 Kuro from Yukitama litter was at ring also. She really has an extremely great gray brindle color and she was showed nicely so she got SQ and was placed third. Congratulations Mirva and Teppo! 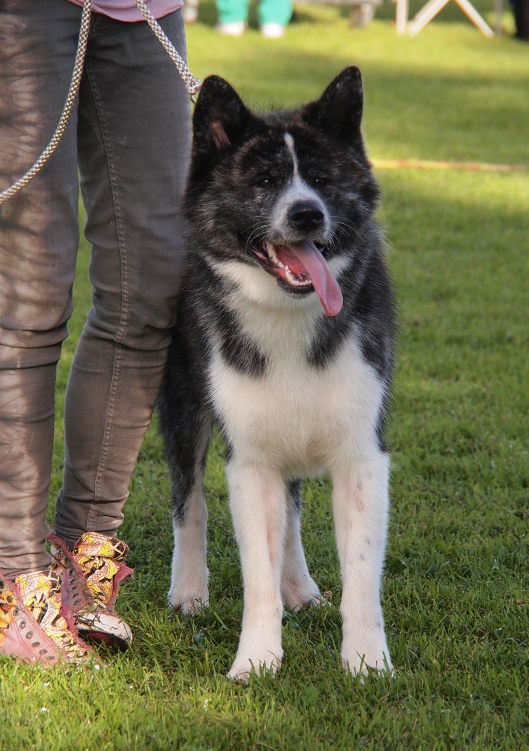 Akira is such a wonderful temperament male. 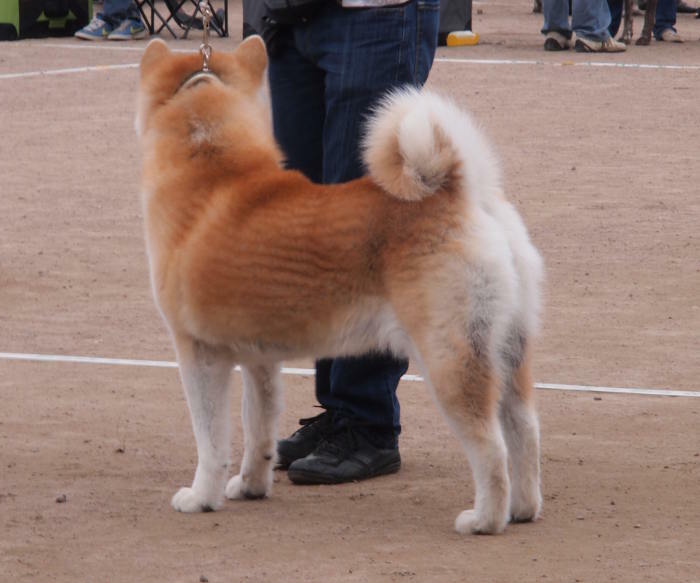 I was with him at the show because his owner had to go to work. He is so easy to handle. Akira still needs time to develop, so he got very good. Unfortunately I got pictures only from winners. 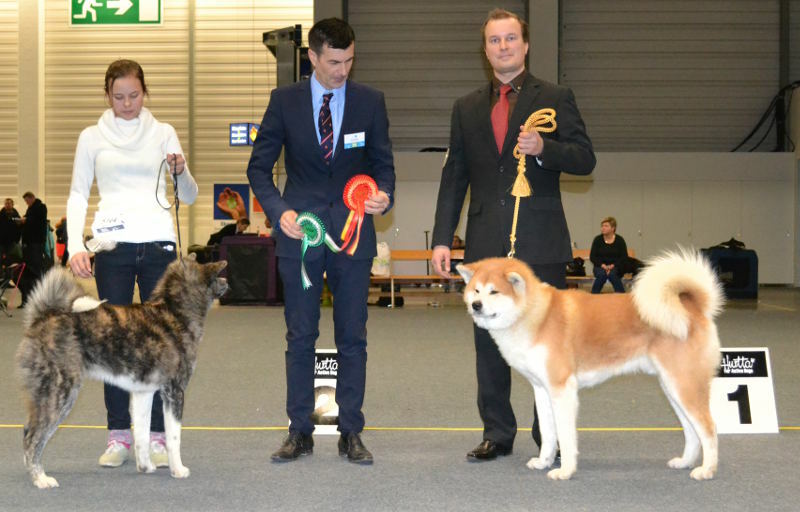 Thanks to the judge and congratulations to others with great success today at Akita ring. 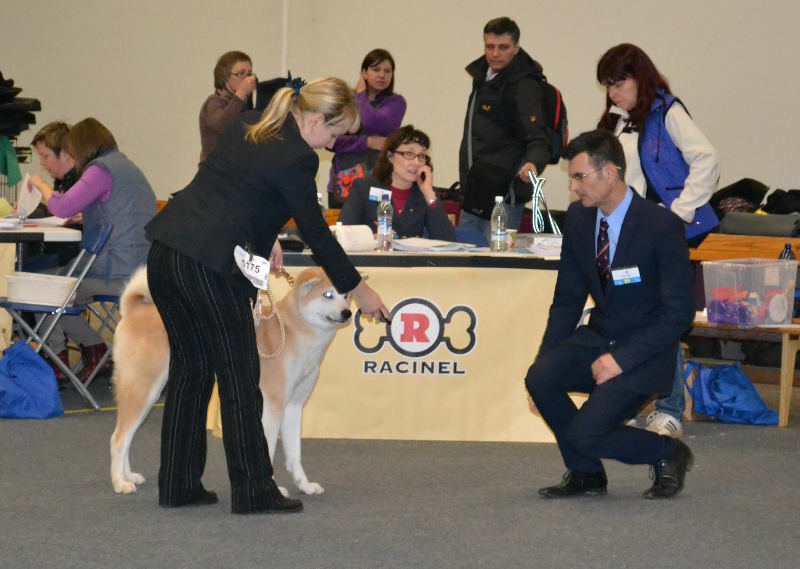 Good luck Mirva to Kuro�s next shows. Kuro is really beautiful mommy and she keeps getting more gorgeous every year. Herkku got sufficient because of his behavior. Herkku is still very unpracticed and needs more training. He is unsecure when it comes to his mouth. And that�s when he might say something to judge. Otherwise his judging is easy. And outside of a ring everybody can come to pet him. Anyway, thank you dear Katri for taking Herkku to show! You have been a big help for me! 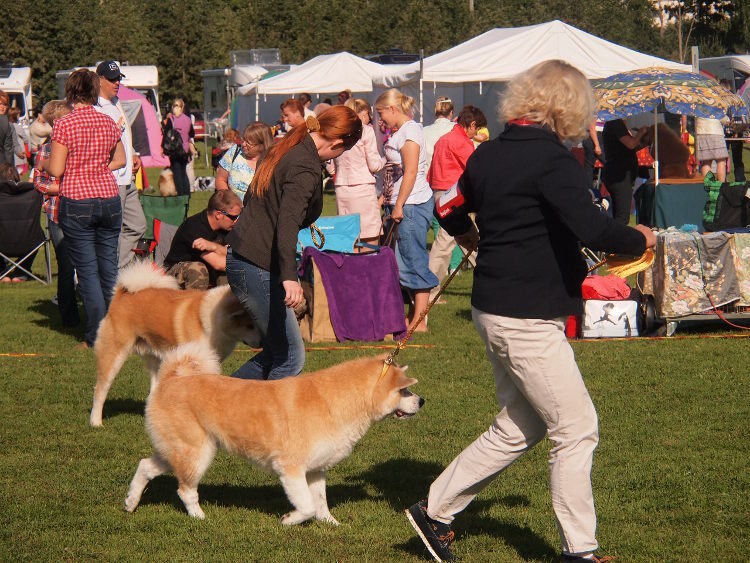 It was so nice to see all the offspring from Sissi at Karjaa. What a start for Daiki! He was at his first show and was BOB with CAC. Congratulations P�ivi! Daiki is one of the Midos with amazing movements. I was with Sissi at ring. The judge liked Sissi, but not her movements, so she got very good. Also Hulda was at the same ring just after few months from her labor. She has recovered quite quickly, but the judge still gave her only very good. Next time with better luck! It was also so nice to see Turo. I haven�t seen him for awhile. I was with Turo at ring. He really is so wonderful with his temperament! And what a great, big head (and heart). Thank you Anita and Pertti for bringing him to the show! Turo was totally out of coat and got good. One victory after another. Inuki is amazing boy! Big congratulations Kevin and Davina!! 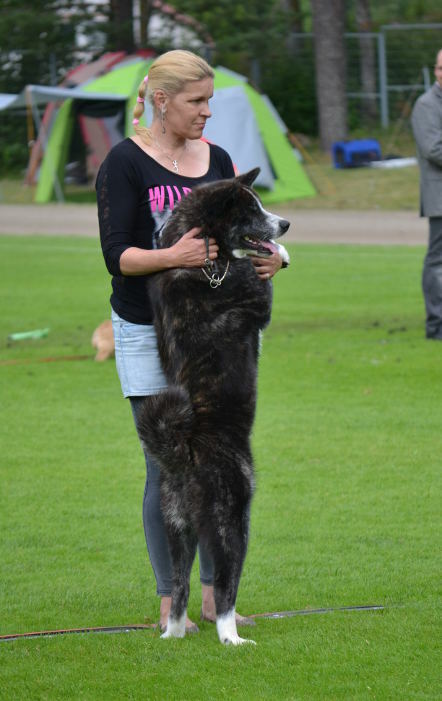 And big thanks to Inuki�s handler Tuulia! 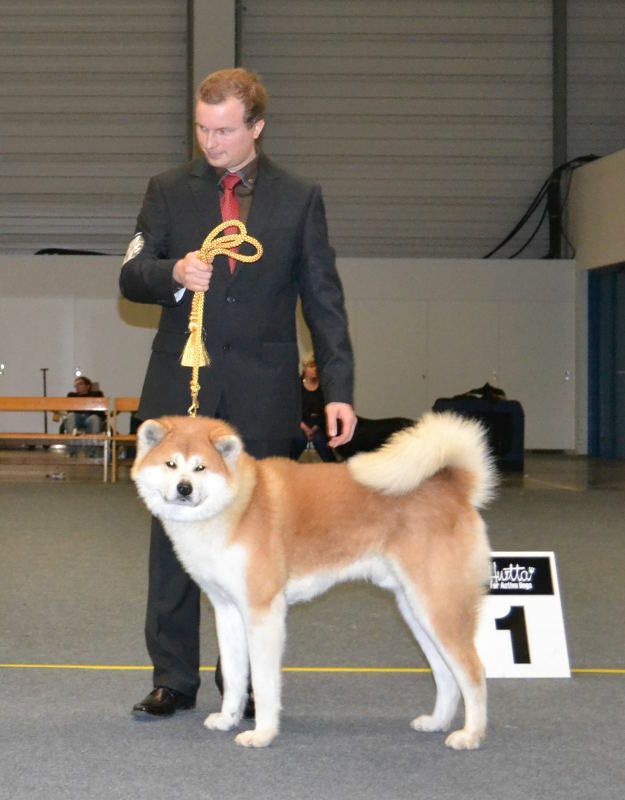 New country, new title... Inuki was BOB and later placed at group being fifth! I�m so happy for you Kevin, Davina and Tuulia!! Big thanks to the judges. We had Sissi and her kids at the ring. Big congratulations to Kirsi and Sirpa for Reetu�s huge success! Reetu was BOB and 2nd Best of Group!! Super success! 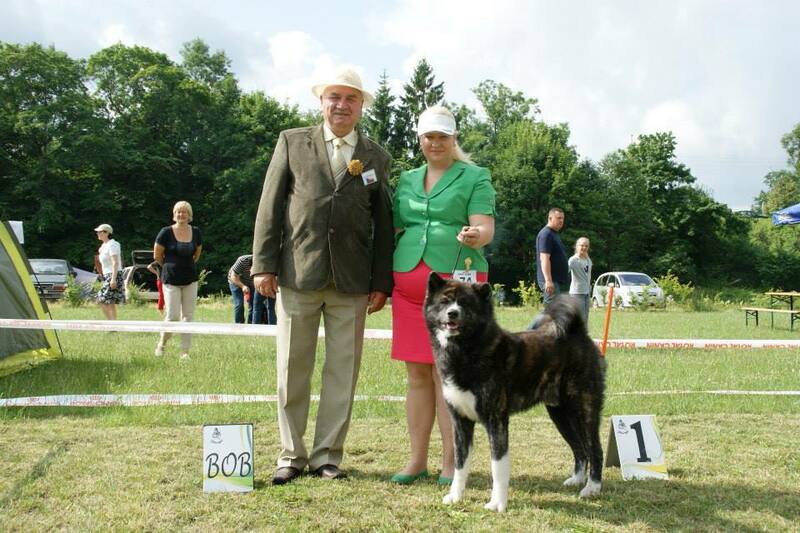 Congratulations also Kirsi�s and Sirpa�s veteran lady Sota who was BOB-veteran. Hulda was too fat for the judge� There are many things that I accept, but this is not one of them. Hulda has never been fat, not even a little. Good luck to next shows Virve and Niko! After a brake Aiko returned to rings, and again was victorious. 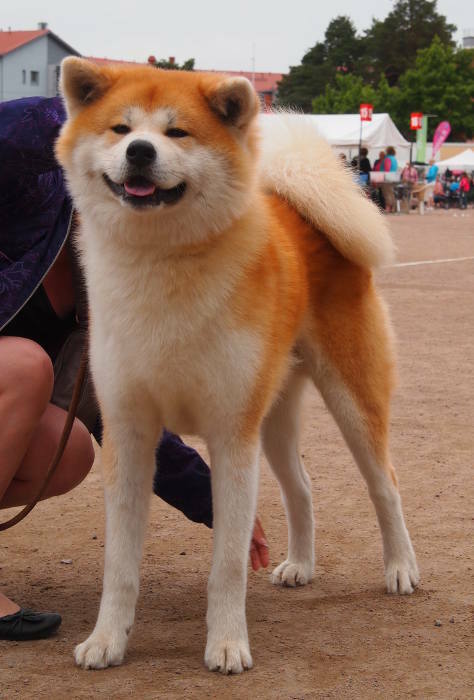 Only two Akitas got SQ, Aiko was one of them. 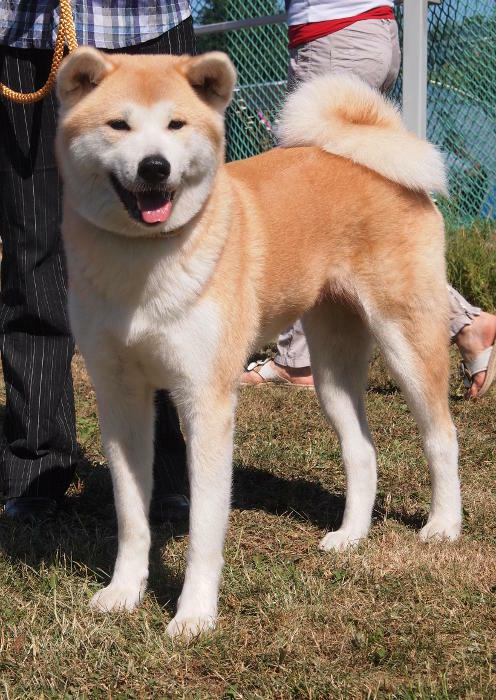 The judge liked very much of Aiko, although he reminded that she could be thinner. 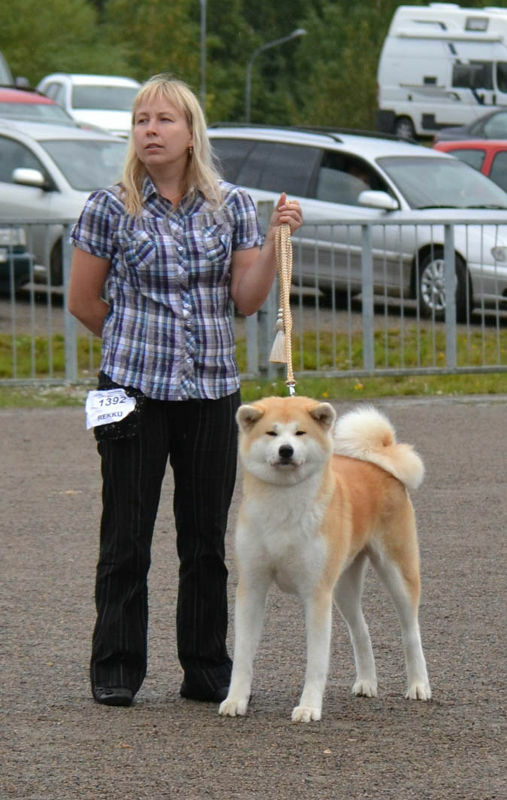 Congratulations Niina for Aiko�s BOB-veteran and best female 2 placement! 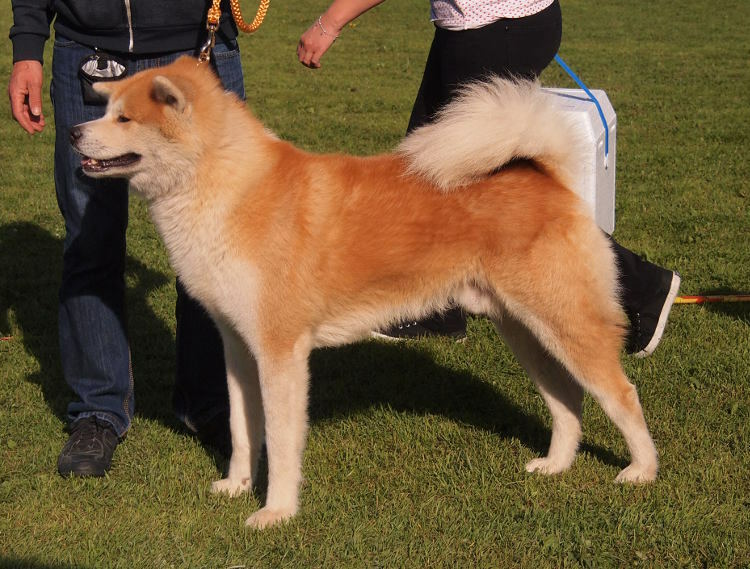 Also Niina�s male Akita Agari was at ring. He was in a good condition, and got very good. The show messed up Agari�s day dreming, so of course he couldn�t run.. So nice show with lovely people and good weather. Siblings Akira and Reika were at their first show. 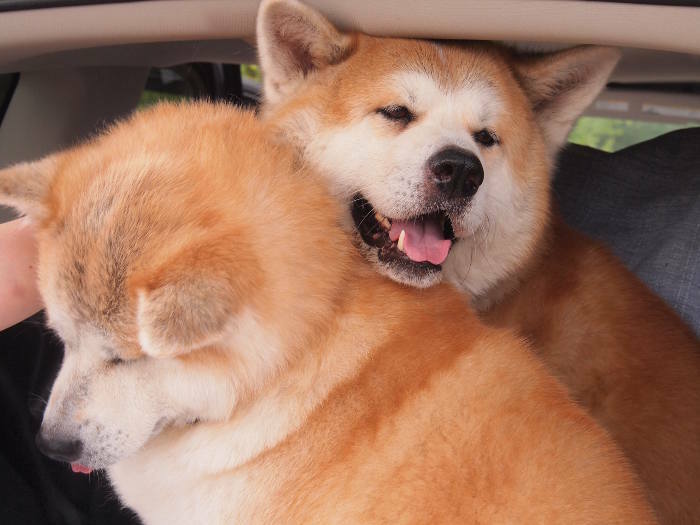 Both of them are so wonderfully happy Akitas. Reika left all her coat at home, so she got only good. 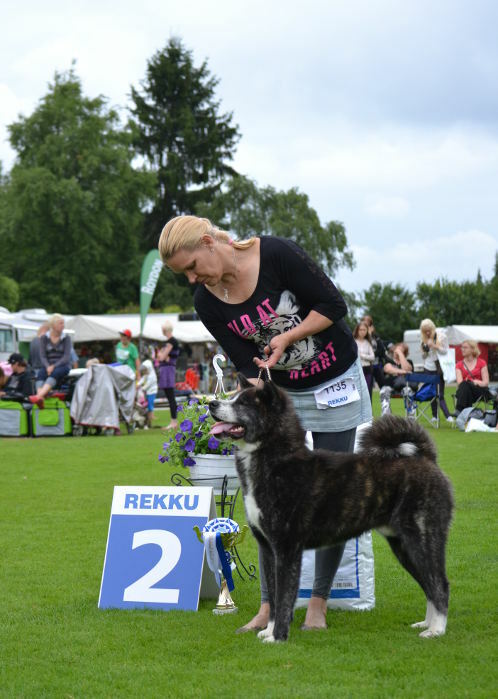 Thank you Reijo for handling your girl at the ring! 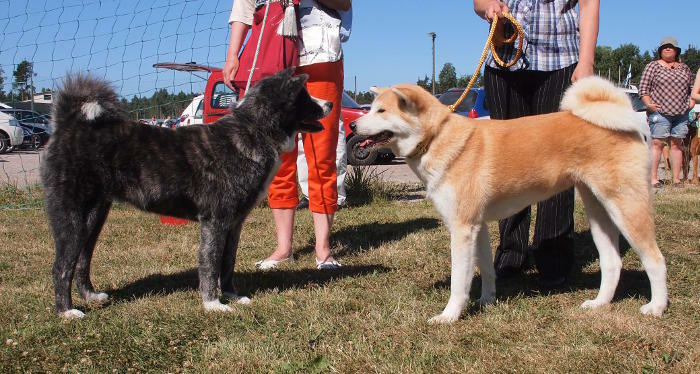 Akira charmed people with his size and wonderful brindle color. I handled Akira and he acted so nicely at the ring. It was also very nice to see Timo and his dogs again. Congratulations Timo for Marki�s BOB! 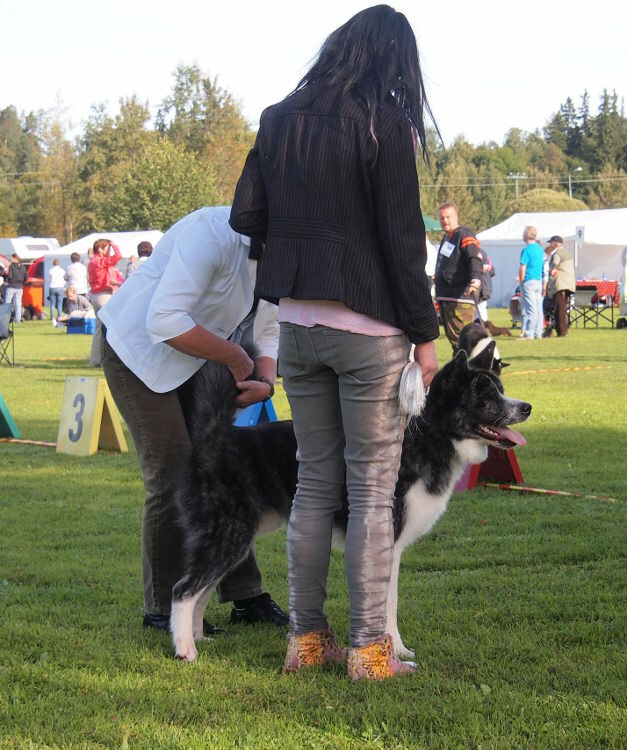 15.6.2013 Estonia INT, judge ? Wonderfull... Inuki has now titles from three different countries! 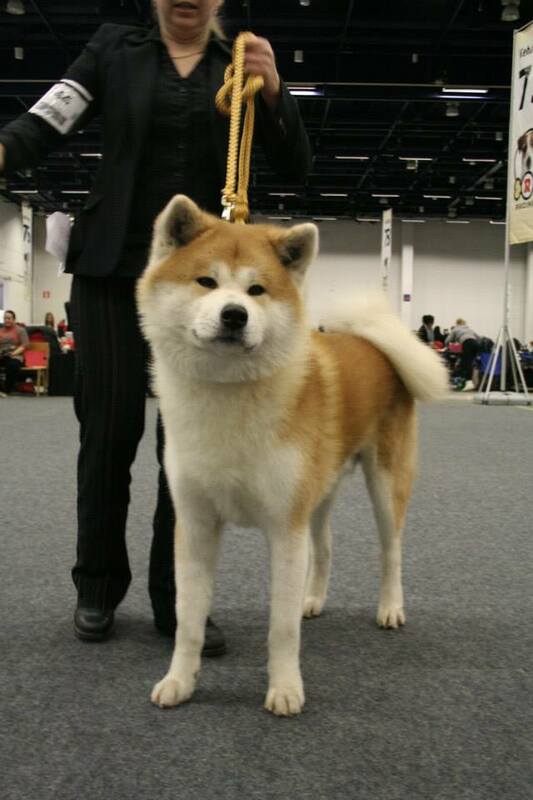 If there wouldn�t be any issues with AKIHO registered Akitas, Inuki would be now International Champion. Hopefully the rules changes sometimes� Huge congratulations Kevin & Co.!! Herkku�s third show and now CAC and BOB. I�m so happy! Thank you Katri a million time for showing and taking care of Herkku!! Herkku�s second show and it went better than the first. Not bad, better result at the next day. 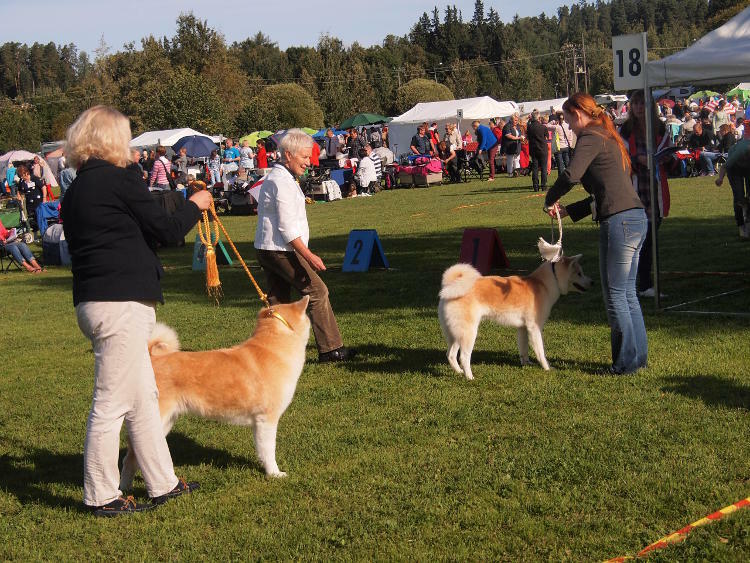 Big weekend for Herkku who hasn�t been at dog shows never before. 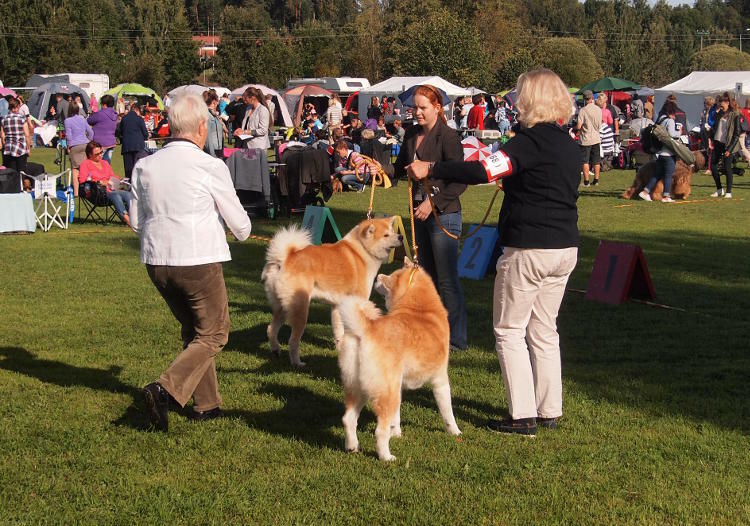 Herkku�s first show ever. We are starting to collect experience for him. Thank you Katri for showing him! Like mother like son? At least the judge thinks that, and gave very good to Sissi and Reetu. Reetu really is amazing boy with golden movements, beautiful color and wonderfully happy temperament. Sissi knows how to act at ring and was lovely to watch. Good luck to both of you, next time with better luck. And congratulations to Kirsi and Sirpa for Sota�s BOB-veteran placement. Kuro keeps getting better with time.. like a good wine. 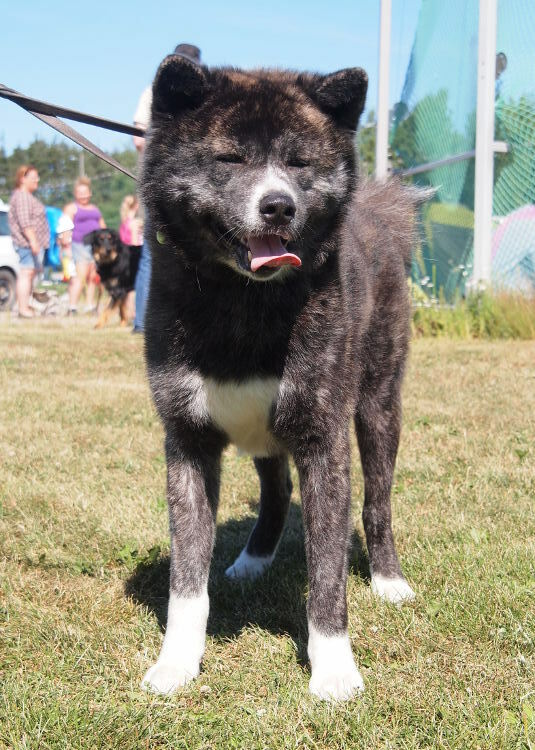 Kuro was in a really good condition and that shows her results. Congratulations Mirva and Teppo! Big congratulations Timo for Hilma's great success! 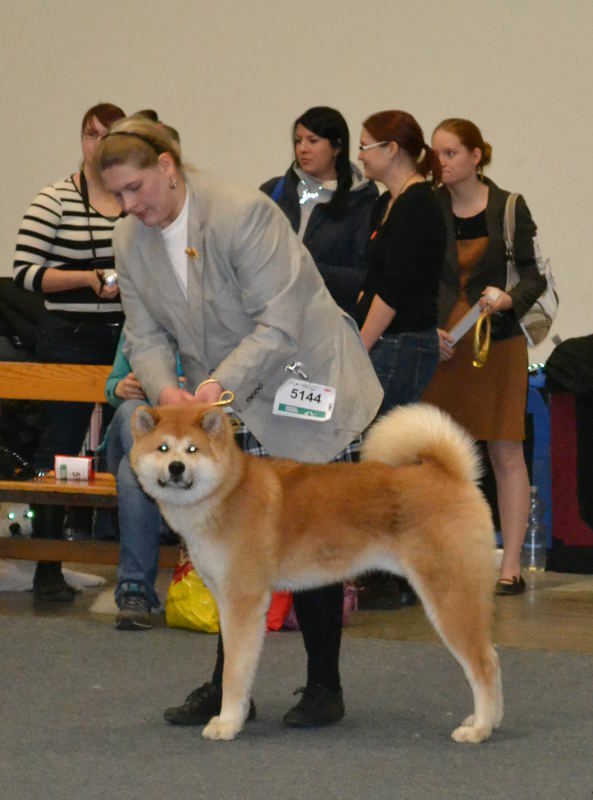 Halla was in her first show and she got a good judgement. She was too heavy and that's why only good. I think she left some extra after her puppies. Thank you Maria for showing Halla and good luck with her! Marski showed really well with Timo, congratulations! Inuki's victories spreads overseas. I'm amazed. Huge congratulations again! 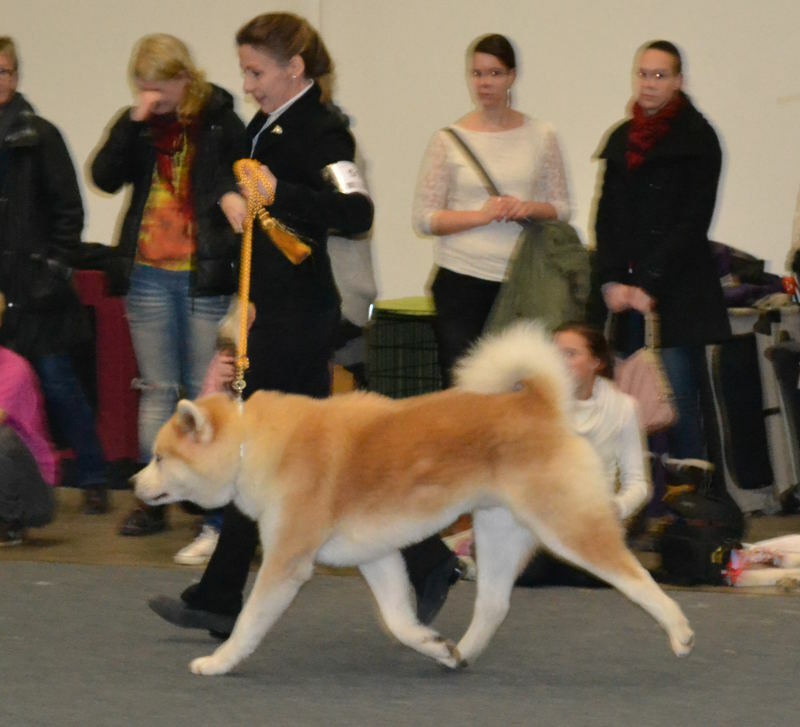 Inuki at his third show; third CAC and Finnish Champion title! How wonderfull is that?! Huge congratulations Kevin & Co.!! !